Tell me what Girl Bike Love and Cyclofemme are all about. Girl Bike Love is a national online publication for women’s cycling. The goal is to provide an online community for women to come and learn about cycling, to be inspired, to connect. We provide gear reviews and technical information and really great stories. We’re working on doing more race coverage as well. We’re trying to bring everything to one place because it’s so segmented right now. We want women to have that special place that’s their own for cycling. Girl Bike Love has been around for about four years now. I’ve been focusing on women for a long time. I ran a bike shop for four years. That’s when I really started to see the importance of more women riding bikes and the lack of opportunity for that. 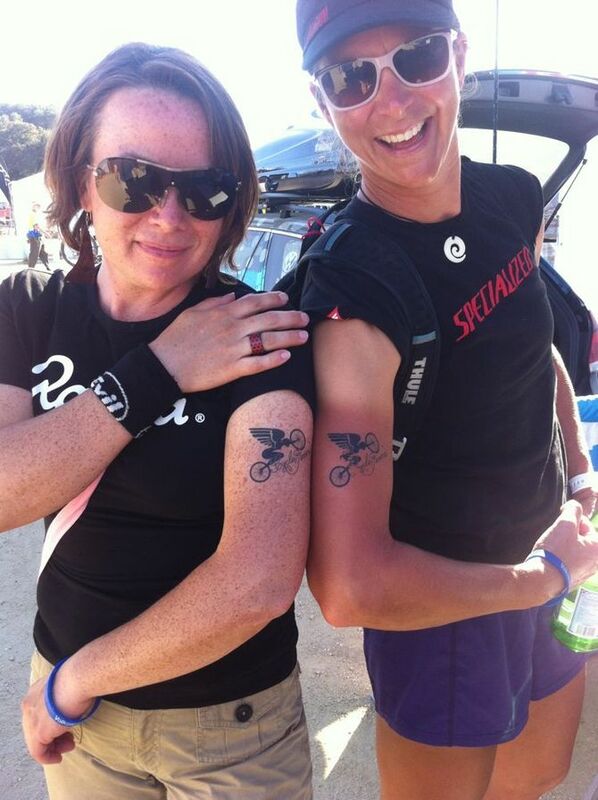 When I started Girl Bike Love there was this overwhelming trend of negativity for women’s cycling. “We don’t have enough gear. We don’t have enough support. We don’t have enough money in racing.” People would say women don’t ride bikes because it isn’t safe. It was all these negative voices out there. This was already a really delicate cycling community and I didn’t want to just segment things that much more and create a self-fulfilling prophecy. I thought we needed something to unify voices with positivity and joy. Cyclofemme started as a global women’s cycling day. The mission is to honor the past, celebrate the present, and empower the future of women’s cycling. It’s growing into more of a celebration of the spirit of women’s cycling with everyone rallying on that day regardless of age, gender, bicycle preference. It’s not women only, it’s in celebration of women. It’s been incredibly unifying. All year women are attracted to the idea that whenever we ride, we ride together. Women still talk about it all year long. We’ve had about a dozen women get the real tattoo. It’s just the coolest thing. Do you have the tattoo? Not yet! I’m so upset that I wasn’t the first one. You mentioned that you ran a bike shop and I gather that you’d done a fair bit of work in the bike industry and bike advocacy prior to founding Girl Bike Love. What’s your history in the industry and how did it help shape your ideas for your current work? I started mountain biking about 18 years ago. I was never really that girl who was intimidated by riding with the boys. There weren’t a lot of women to ride with. I was fortunate because my dad had a car garage. I was raised around tools and there was an expectation that I would be able to change my oil and do all of those things. I was comfortable with the technical ideas of bicycles. 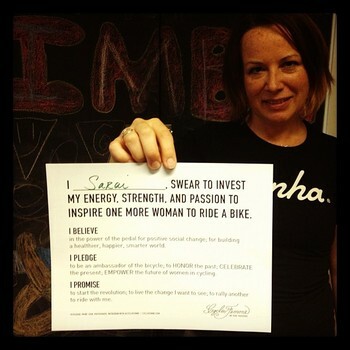 But once I got more involved in the bike shop, I realized that’s not the same for most women. There’s very little expectation–or has been at least–in our society for women to know how to use tools, to be comfortable in that sort of setting. That’s a barrier we have to overcome that exists outside of the cycling world. I was living in northern Kentucky, right across the river from Cincinnati, Ohio and I ran a bike shop for about four years. In that time I was able to develop the women’s community around the shop. Our group rides grew from about 10 people on a Tuesday with me being the only women to anywhere from 30-60 people on a Tuesday, a third of them women. We were able to grow the whole community by bringing more women into the shop. I started to see what cycling did for these women who came in as beginners. There was a transformation in their lives, in their personality, in everything as they became daily riders. It’s just such an empowering thing for people to do for so many reasons. I cofounded Queen City Bike, which is a Cincinnati and Northern Kentucky bicycle advocacy organization. We started planning bike month activities all around the city. Out of that grew the nonprofit organization dedicated to changing bicycling in that area. It’s been super successful. The number of cyclists has grown significantly. Seeing just how important women were to that part of developing the community was really important in helping me recognize how much we needed to encourage more women to ride bikes. I got to know a lot of people in the industry from running the bike shop, going to Interbike and other trade shows. When I moved out to Colorado, I started Girl Bike Love. I worked in another shop for a short time helping them with their marketing. I’ve also done consulting for different brands on products and marketing. I’ve been on the Women’s Advisory Board for the League of American Bicyclists for the last few years and I was on the board of Community Cycles in Boulder for a little while. That is a certainly a broad spectrum of the bike world. Given that, it seems like you’re well qualified to talk about what the industry has historically done wrong in marketing to women or creating women’s products and now what the industry is doing right. I try really, really hard not to focus on the negative and say “this is what you haven’t done.” Because I don’t think that is a good use of anyone’s energy or time. I feel like I have a limited amount of time because I’ve become a spokesperson and gotten involved in all of these things. I like to focus on the things we can do moving forward, the things we have done that worked really well. There is a huge potential for connectivity between all of efforts in women’s cycling. That’s where the greatest opportunity lies. For women’s racing, for the professional women’s cycling world to be more successful, we need more fans of racing. But to find more fans of racing, we need more women riding bikes. I see it as this big circle connecting all these dots so each one fuels the other. If we can get more coverage for women’s racing, we’ll have more fans, we’ll have more women interested in riding bikes because they have sports figures to look up to. We need greater connectivity between those efforts and we need greater support for women’s business and women in the industry who can push that effort forward. I’ve said this a few times lately. I also think it’s really important for people to recognize that women are not the opposite of men when it comes to gear. We still want the same things: super high quality, super high functioning. We still want the best stuff that’s out there. But it’s really important to recognize that we’re cyclists before we’re women. We’re road bikers, mountain bikers, transportation cyclists. We still have that huge spectrum. If you fill the needs of the cyclist first as an individual, then the gender issue will be less important. Snyder with the Cyclofemme pledge. Photo from Cyclofemme.com. Do you see a need for more connectivity between traditional advocacy, bike-as-transportation side of things and the racing side of things? There’s definitely strong efforts afoot in both those parts of cycling. I tend to look at things from a global perspective. The bicycle has been so important. It provides three main things. Access, connectivity, and mobility. Access to economic development, education, healthy care. Mobility to get anywhere you need to go. And connectivity, it brings people together. It also adds this element to our lives that’s hard to explain to someone who doesn’t ride bikes. It changes our outlook. It makes us see things in a different way, in a more positive, empowered way. There’s really nothing else in the world that can do that. So when you separate those elements of a bicycle it becomes less important and less powerful. Connecting transportation cyclists to racers is how we can have the greatest possible voice. 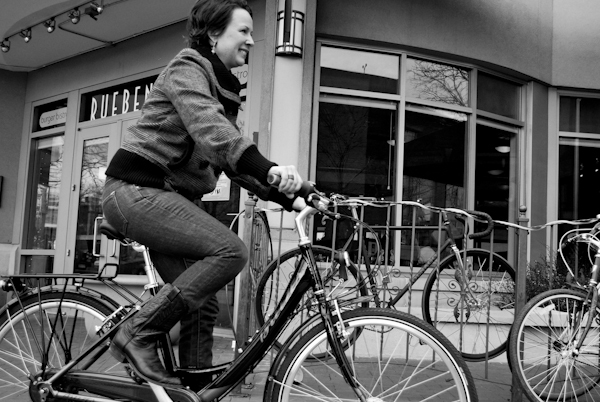 With Cyclofemme we say “regardless of bicycle preference.” It’s a celebration about people. It doesn’t matter what you ride or why you ride. It’s because we all ride bikes we’re in this tribe, in this sisterhood. That’s something I’ve been thinking about a lot lately. I personally ride for transportation and sport and recreation, but I know plenty of people who just do one or the other. As you say, it’s a huge opportunity to have a giant, unified voice. There’s just a lingering question in my mind whether or not everybody has the same goal. Cycling means such different things for so many different people. I think so too. Some of it depends on where people are in their progression as cyclists. Most people I know who ride bikes eventually get into all aspects of it. It’s just a matter of where they are in that spectrum. Though I would say that sport cyclists are more likely to adopt transportation by bike than transportation cyclists are likely to adopt cycling as a sport. That’s one of the important things for general cycling advocacy, which usually tends to be focused on infrastructure and transportation cycling. People for Bikes is starting to do a better job of connecting the sport. But when I worked in a bike shop, I recognized very quickly that the sport cyclist was the person who was much more likely to go back to transportation. Growing the sport also grows the transportation side. Let’s say Girl Bike Love and Cyclofemme and all the other efforts afoot had enormous success worldwide. What does gender parity in cycling look like? The ultimate goal would be for me to put myself out of business, right? I think to a certain extent we’ll always need something like Cyclofemme and Girl Bike Love, but we try to be super inclusive. Even though we’re focused on women, we don’t exclude men at all. We actually encourage men to get involved. We call them our manbassadors. It’s really important that we don’t create another island. I try to stay away from encouraging too many women-only events. It’s important to have women-focused events because women need a place to be comfortable. But once they get comfortable the hope is that we have inclusion. What are your plans for GBL & Cyclofemme from here? Going back to the idea that sport cycling is so important to the bigger picture because it gets so much more coverage and attention, with Girl Bike Love we’re really trying to support the pro women’s fields better. We’re trying to get their stories out there and do better race coverage. We’re also working on the website itself to make it more available for people as a community. We’re creating opportunities for women to have a stronger voice on the website. We’re super excited for Cyclofemme this year. The date for the event is May 11. This year we were really trying to have more rides in more countries. The reality of it is that each individual ride is getting so much bigger. And the kind of support we’re seeing is not quite what we expected. It’s super positive, but it’s just a little different direction. It’s not more rides, it’s bigger better rides. This year we have a lot of bike share companies on board to support Cyclofemme. Citibike in New York City, San Francisco Bay Bike Share, Boulder Bike Share, and also Fort Worth, Texas. Some are providing free rides for women on that day. Some are doing tattoo stations. Some are having designated, suggested routes to support Cyclofemme. On the other end of the spectrum, we’re hoping to have a good amount of support for the women in the Tour of California race on May 11 as well. It goes back to that idea of coming full circle, bringing the whole thing together and all of us recognizing we have to support each other whether we’re transportation or professional cyclists. This entry was posted in Bike Industry, Cycling Media, Interviews, Racing and tagged boulder colorado, cyclofemme, gender gap in cycling, girl bike love, professional women's cycling, sarai snyder, women and bikes, women and cycling. Bookmark the permalink. Great perspective and insight! Agree with all of it, keep up the great work.